MONTREAL — Loblaw Companies Ltd. says it is among the first purchasers of Tesla's new electric truck. Canada's largest supermarket chain says it has pre-ordered 25 of the vehicles called the Tesla Semi. "It's part of our commitment to electrify our fleet," spokeswoman Catherine Thomas said. Earlier in November, Loblaw committed to have a fully electric fleet as part of the company's commitment to reduce its carbon footprint by 2030. That would involve adding 350 zero-emission vehicles and more than 2,500 trailers to the fleet. Tesla says the Semi can go from zero to 100 km/h in five seconds without a trailer, compared to 15 seconds for a comparable diesel truck. It says the Tesla Semi requires no shifting for smooth acceleration and its brakes recover 98 per cent of kinetic energy to the battery. "Overall, the Semi is more responsive, covers more miles than a diesel truck in the same amount of time, and more safely integrates with passenger car traffic," it said on the company's website. The Ontario-based Loblaw said removing diesel from its transport trucks and refrigerated trailers could reduce more than 94,000 tonnes of carbon dioxide emissions annually, the equivalent of removing more than 20,000 cars from the road. By 2030, Loblaw expects to have reduced emissions from electricity use by 35 per cent, transportation by 25 per cent, and refrigerants by 50 per cent. 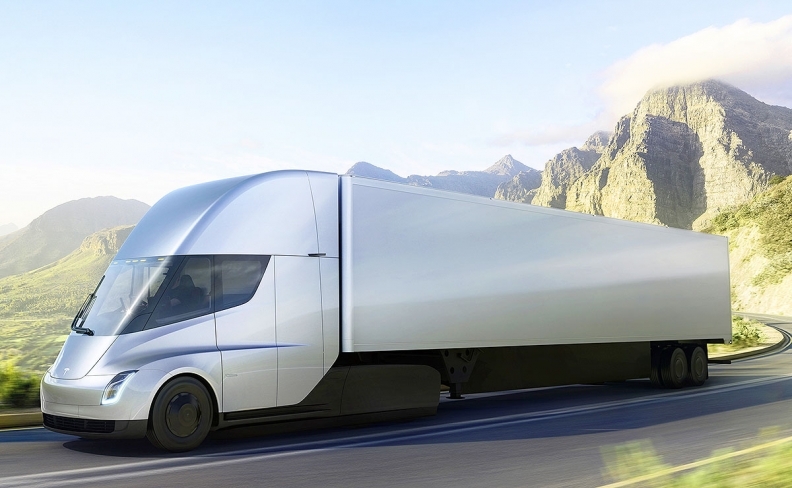 First deliveries of the Tesla trucks are expected in 2019. No price for the trucks was provided, but reservations for the Tesla Semi cost US$5,000 per truck. "We have a long history of testing new technology _ including alternative-fuel trucks _ and we are excited to be among the first to pilot this new heavy-duty electric vehicle," Wal-Mart spokesman Ryan Curell wrote in an email. "We believe we can learn how this technology performs within our supply chain, as well as how it could help us meet some of our long-term sustainability goals, such as lowering emissions."